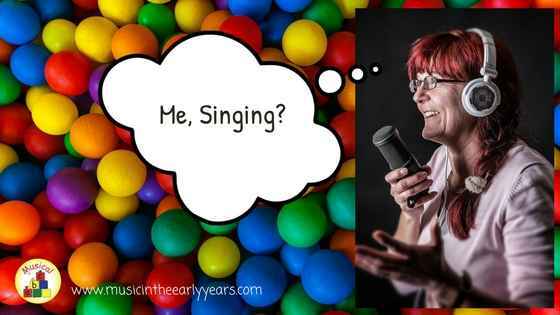 Does the thought of singing make you feel stressed? I can’t remember how the conversation came up but I was telling a lady about this article after she commented about her inability to sing. She recalled how a teacher’s negative comment about her singing had stayed with her to this day! I then went on to tell her about how I sat with my mum, who also believes she can’t sing, and with encouragement, she sang a very simple song in tune! So, will you sing in front of the children? Children really don’t judge, they just want to sing. If you feel that your voice is limited that’s okay as most songs that we should be singing, within the early years, need to be simple and so that should make it easier for you. Young children’s voices are limited by range; volume; jumps in pitch; notes too close together.… (I discuss all this more in my Magical Music Time online training course). Therefore it is important that we choose songs that are simple. Or know that we’re not always asking children to sing or sing all of a song. It could be limited to a small range and lots of repetition. E.g. Big Bear, a song I wrote. When I did an event one summer a child who attended only heard Big Bear at the event but she sang the main repetitive phrase all the way home; I had an email from a mum to let me know! People names: e.g. Sally in, Sally go round the sun. Movements e.g. The big ship sails: marching around in a circle, wagging finger, moving up and down, shaking head in the sea. It is also worth noting that within the early years we’re putting in the foundations of a song for when a child's ready to learn it in the future. Singing is such an enjoyable experience; we should all feel it is possible!